In 2004, Pino Rodriguez’s Camden neighborhood was so blighted that the divorced father’s children were not allowed to sleep at his house. So Rodriguez took matters into his own hands, creating the Block Supporter Initiative: an effort to engage his neighbors in beautifying and improving their neighborhood by planting flowers, cleaning up debris and otherwise taking ownership to turn things around. The Block Supporter Initiative was such a success that crime declined, and Rodriguez was hired by Camden Lutheran Housing to expand his work to other neighborhoods. This month, Rodriguez was rewarded for his efforts with one of New Jersey’s most prestigious honors: the Russ Berrie Making a Difference Awards top prize, which includes a $50,000 cash award. Benigno (Pino) Rodriguez (center, holding award). The Russ Berrie Making a Difference Awards honor New Jersey’s most extraordinary unsung heroes, whose outstanding community service and charitable contributions have made a substantial impact on the lives of others. The awards, established by the late Russell Berrie, are funded by The Russell Berrie Foundation and administered by Ramapo College, with recipients selected by a panel of independent judges. The 22nd annual awards, accompanied by cash prizes ranging from $5,000 to $50,000, were announced at a ceremony at Ramapo College on May 4. REV. MILDRED FARRAR of PATERSON (Passaic County), who received the $35,000 award for her extensive work with the Paterson community, which began in the late 70s. Many years ago, when her 15-year-old daughter became pregnant, Farrar was there to guide her through that challenging time. Decades later, as her 82nd birthday approached, she decided she wanted leave a legacy to help other teen mothers. When her neighbor's house became available, she purchased it and created "Millie's Place: A House of Refuge," a place for teen and single mothers to gather, receive supportive services and create a path forward for their own families. The program incorporates financial literacy, parenting skills and tangible support such as food and clothing. Soon after, Farrar launched the Faith in Action Community Development Corporation, which assists nearly 100 families in the Greater Paterson area weekly, providing fresh food, clothing, household items and a listening ear. Farrar, who is approaching her 87th birthday, has helped countless women and continues to serve her community. MELISSA GERTZ of RINGOES (Hunterdon County), who received the $25,000 award for her tireless advocacy on behalf of people with disabilities. After surviving a near-fatal car accident in 2004 that resulted in traumatic brain injury and PTSD, Gertz endured countless surgeries and rehabilitative therapies. She emerged with an acute understanding of what it is like to be disabled, and to have to fight endlessly for disability payments while one is ill, medicated and trying to get one’s life back together. This experience inspired Gertz to found the Community Justice Center, an innovative legal services nonprofit in Trenton that serves low-income and homeless people with disabilities, as well as returning veterans with disabilities and their families. The center, the first of its kind in New Jersey, transforms lives by providing legal assistance (including representing veterans before the Department of Veterans Affairs and Social Security Administration) and by collaborating with community organizers, civil rights activists and other experts to encourage the empowerment, resiliency and rights of those with disabilities. Angelica Berrie, president of The Russell Berrie Foundation, and Dr. Peter Mercer, president of Ramapo College, with the top three honorees: Left to right, the Rev. Mildred Farrar, Melissa Gertz and Pino Rodriguez. EDRICK ALLEYNE of EATONTOWN (Monmouth County, $5,000 cash prize) was playing with his children at Seven Presidents Oceanfront Park last September, when he heard a man shout, “Somebody help! My nephew is drowning!” Looking out at the ocean, Alleyne saw Dustin Fleischer, a 28-year-old professional boxer, caught in a rip current about 50 yards off shore. Alleyne was the only person brave enough to get into the water. “Something came over me and told me to do it,” he later said. He went about 25 yards out into the water — up to his neck in the rough surf — and began coaching Fleischer to ride the waves in. Once Fleischer was close enough, Alleyne was able to grab him and bring him to safety. Exhausted and disoriented, Fleischer never got his rescuer’s name after the incident, so he contacted the Asbury Park Press for help. Alleyne’s girlfriend saw the story and the two men met, giving Fleischer a chance to thank the man who had saved his life. EILEEN GOFF of FORT LEE (Bergen County, $5,000 cash prize) is an advocate and leader who has been making a difference in the lives of people with vision loss and other disabilities since 1974. Her first initiative was the Shining Lights Program, which addressed the leisure time and independent living needs of older adults with disabilities, and which serves as a model nationwide. In 1978, Eileen founded Athletics for Blind Leisure Enthusiasts (ABLE) to provide year-round active outdoor activities. A few years later, she established Heightened Independence and Progress (HIP), an agency that helps Bergen County residents with disabilities. Eileen went on to start Multimedia Transcription Service, which transcribes printed material into Braille, resulting in the production of Braille books in 42 states. She promoted the barrier-free renovation initiative that helped disabled Bergen County residents equip their homes to meet their needs, and initiated legal action against developers who failed to address barrier-free needs in new construction. As a young teacher of children with disabilities, TOBA GROSSBAUM of LIVINGSTON (Essex County, $5,000 cash award) was troubled by the struggles she saw her students and their families endure. In 2000, she and her husband, Zalman, founded the Friendship Circle of New Jersey, which offers social and recreational opportunities for children and teens with special needs — nurturing confidence and self-esteem in a safe, warm and welcoming environment. The Friendship Circle’s distinctive approach of pairing participants with teen volunteers motivates, inspires and enriches everyone involved. The Friendship Circle now has six locations in New Jersey and 85 around the world, with more than than 6,500 teens becoming volunteer mentors and friends to children with disabilities. Grossbaum is also the driving force behind the creation of LifeTown, a state-of-the-art ,53,000 square foot simulated village designed to help prepare young people with special needs for independent living. A’DORIAN MURRAY-THOMAS of NEWARK (Essex County, $5,000 cash award) lost her father to gun violence at the age of seven. From that tragedy, she learned the importance of having a support system to help navigate life after an immense loss. When she was just a college sophomore, Murray-Thomas created SHE Wins to reach other young women from Newark who have been affected by violence. Focusing on social justice, mentorship and leadership development, SHE Wins equips girls with the skills needed to not only excel academically, but to help solve the issues that most affect their lives and communities. Since founding SHE Wins in 2015, Murray-Thomas has helped more than 200 girls between the ages of 10 and 15 through workshops, conferences, and summer and after-school programs. The journey for JODI O’DONNELL-AMES of TITUSVILLE (Mercer County, $5,000 cash award) began in 1995, when her husband, Kevin O'Donnell, was diagnosed with ALS (Amyotrophic lateral sclerosis, also known as Lou Gehrig’s disease). Sadly, Kevin passed away in 2001. Jodi later married a man who had also lost his spouse to ALS. After witnessing the effect the disease had on her children and stepchildren, she created an organization called “Hope Loves Company” in 2009, to provide educational and emotional support to children and teens who had or have loved ones battling ALS. It is the only nonprofit in the country dedicated solely to helping children of ALS patients. Hope Loves Company holds free weekend retreats that allow these children, many of whom serve as caregivers to their parents, a chance to “just be kids” for a short time. Counseling is offered, team building and coping skills are taught, and children are able to bond with others who understand what they are going through. So far, 15 camps in five states have hosted hundreds of children and family members, and there has been interest from every state in the country. DON QUIGLEY of MANALAPAN (Monmouth County, $5,000 cash award) co-founded the Society for the Prevention of Teen Suicide in January of 2005 after experiencing the devastating loss of his teenage son, Sean, the year before. The mission of the organization is to increase awareness and reduce suicides by empowering teens, parents and educators with the emotional guidance and skills needed to help those at risk. Because of the Society’s efforts, New Jersey became the first state to require all educators to complete at least two hours of instruction in suicide prevention as part of their professional development. SPTS has presented in-person to more than 12,500 educators, parents and students and trained over 250,000 educators through its online training program. The Society for the Prevention of Teen Suicide’s life-saving resources reach more than 236,000 individuals each year. ETHAN SANDLOFER of UPPER SADDLE RIVER (Bergen County, $5,000 cash award) knows that kids can make a difference. At just 11 years old, Ethan has raised close to $400,000 for rare cancer research through “E’s Battle Buddies,” an organization he began in honor of his mother, Gabby, who died of a rare form of cancer when he was just two years old. E’s Battle Buddies hosts interactive, kid-oriented events such as indoor cycling and obstacle runs, while raising awareness and money for lifesaving rare cancer research and teaching kids the importance of giving back. Last summer, Ethan donated $90,000 to the John Theurer Cancer Center at Hackensack University Medical Center to fund groundbreaking research and clinical trials, pay travel expenses for cancer patients and their families, and purchase prosthetics for patients who have had amputations due to cancer. This month, Ethan is hosting the 2018 Kids Fighting Cancer fundraiser in Bergen County, which has already raised more than $60,000. In 2008, CARLA SCARABINO of MONMOUTH BEACH (Monmouth County, $5,000 cash award) co-founded the Beauty Foundation for Cancer Care, a volunteer-led nonprofit with a mission to alleviate the tremendous physical, emotional and financial strain that cancer treatment places on families. The Beauty Foundation raises money to offset the expenses that families face — which often aren’t covered by insurance — such as childcare, household expenses, transportation and meals. Under Scarabino’s leadership, the Beauty Foundation has supported approximately 1,500 cancer patients by providing more than $2 million in grants and services to families throughout New Jersey. By partnering with a broad group of like-minded organizations, the foundation provides patients and their families with critical information, resources and support. 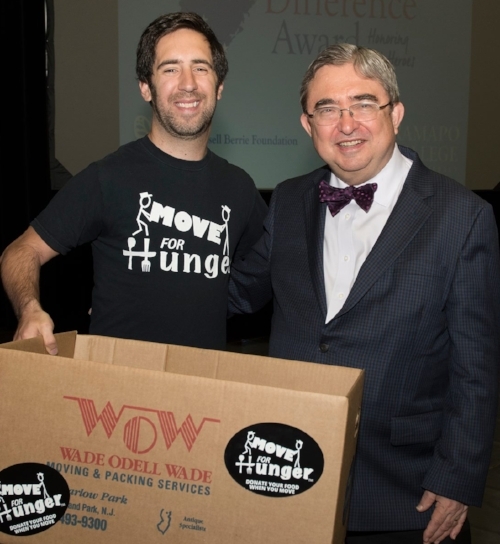 At the May 4 ceremony, the keynote address was delivered by Adam Lowy, the founder and executive director of Move for Hunger and a 2016 recipient of the Making a Difference Awards. Adam Lowy (left), the founder and executive director of Move For Hunger, who delivered the keynote address at the 22nd annual Russ Berrie Making a Difference Awards ceremony, with Dr. Peter Mercer, the president of Ramapo College.